Reading have completed the signing of Wolves defender Ivar Ingimarsson for an initial fee of £100,000. New boss Steve Coppell moved to make the versatile defender his first signing for Reading, with centre backs Steve Brown and John Mackie both facing lay-offs. The two-and-a-half-year deal could rise by another £75,000 depending on appearances and Wolves will also be entitled a sell-on fee. Crystal Palace also made an offer for the 26-year-old defender, but Ingimarsson was keen to rejoin Coppell having played under him at Brentford and Brighton. "I'm very happy and relieved to have joined Reading," he told the club's official website. "When they contacted Wolves, I knew I wanted to come here. They are a big club with a nice stadium and everything is set up as though it is here to stay." Ingimarsson admitted Coppell's move to Reading played a big part in his decision to move. He said: "It is always very nice when someone you know comes in for you. 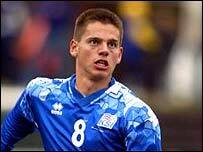 I also know Steve Sidwell from my time playing with him at Brentford. "Crystal Palace did come in for me as well, but I was happy to come here." Coppell revealed he is planning further signings but insisted none is imminent. "I think a club like Reading should have a well-defined plan to go forward," said Coppell. He added: "If the right players come along at the right price and fit into that plan then there could be signings. "But I haven't discussed that with the chairman yet and there is nothing happening at the moment."